Every month I read a book which I would be unlikely to choose myself. Why, you ask? For my reading group. We all take turns making suggestions, and while you can see patterns in what some of us suggest, occasionally there is a book which knocks me sideways out of surprise. Nothing to Envy is one of those books. 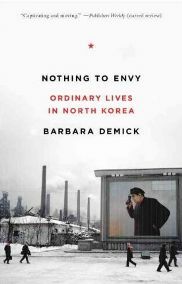 Written by journalist Barbara Demick, Nothing to Envy: Real Lives in North Korea is a collection of true stories about life in the country under the regimes of Kim Il-sung and Kim Jong-il, told by defectors who have left North Korea. Demick opens by discussing what we know of the country, which is really very little – it is in her introduction that she mentions the fact that North Korea is a “black hole” on satellite photos of Asia at night, a fact which I hadn’t realised and which captivated me. What could life be like in a country like that, a country which we know so little about except that it is “closed”? Difficult, tense and horrific are the easiest answers. Prior to the famine in the 1990s, life for the average North Korean was difficult and worrisome, but they were fed, clothed and housed by the Communist government. There was the constant worry that someone in the family might say the wrong thing against the party or the leader, leading to the whole family being taken off to a labour camp. There was also the problem of social status, which could not be changed and was determined by a family’s history – one of our protagonists, Mi-ran, has a low status due to her father having been a South Korean POW who was eventually allowed to live normally in North Korea. Mi-ran cannot hope to raise her status. However, the famine brought widespread death and disease, as well as a change in the ways things were done – people defied the rules and set up markets, sold their homes and possessions, just in order to feed themselves. An escape trade opened up over the border to China, with many trying to leave – although some went back and forth over the border to make money or buy food. There was no food to be had in North Korea, and the people had to resort to picking grass and weeds to survive. Needless to say, this led to malnutrition, and a generation of North Koreans have stunted growth and poor health. It is telling that another protagonist, Dr Kim, had her wake-up call just over the border in China: she saw a dog’s food bowl filled with rice and vegetables, better food than she had eaten for a long time. There really is only one way to describe Nothing to Envy: eye-opening. After the Korean War, North Korea was more advanced than South Korea, but the situation is reversed now. The North Koreans who defect to South Korea struggle to acclimatise, they have no concept of almost everything which is part of daily life there. To read about what these people have been put through by their leaders is painful. North Korea has the fourth largest army in the world, and a nuclear weapon programme, yet its people lack the most basic of human needs. We read about North Korea and Kim Jong-il in the news, with the country portrayed as somewhat of a villain on the world stage, but we don’t hear about the people of the country – and so perhaps we don’t consider what their lives may be like under such a ruler. Demick has done more than consider it – she has found out, and written the stories down so that more of us can be aware. There is a noticeable journalistic style to Nothing to Envy, which is to be expected given Demick’s background, yet for a journalist she is very good at getting inside the characters of those she writes about. You can feel a connection with many, if not all, of those she has interviewed in order to write this book. It is hard to sum up my feelings about this book. I am glad I read it, but I don’t think I would say that I enjoyed it – it is not a book which you can truly enjoy, given its subject matter. I do feel that my eyes have been opened, and I feel somewhat shell-shocked by what I have learnt. Demick has written a hard yet necessary book with Nothing to Envy, and it is one which needs to be read. One Comment on "Nothing to Envy: Real Lives in North Korea"
My favourite book. Can’t switch it off after I put it down. Love it a lot. Glad that you feel the same.